In its 2017 boiler review Which? has awarded a Best Buy accolade to all 63 Grant oil-fired condensing boilers with Grant being the only manufacturer to receive an Oil Boiler Best Buy this year. Grant’s oil-fired condensing boiler range consists of Vortex and VortexBlue models, all of which have achieved a Best Buy status from Which? 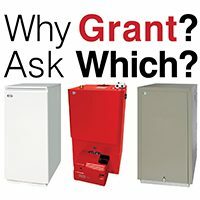 The Grant Vortex range comprises of internal, external, wall hung, boiler house and combi models, with sizes from 12kW up to 70kW. Available with system options, they come with a 5-year guarantee when installed by a Grant G-One Installer*. For end-users looking to reduce their annual fuel bills, the boilers achieve efficiencies of up to 93.3% (SAP: 2009). In addition, models such as the Vortex Eco Utility 15-21kW and the Vortex Pro Combi XS 26kW are only 348mm and 515mm wide respectively, making these slimline boilers ideal options when space is at a premium. In early 2016 Grant launched the VortexBlue range which includes 15 internal, external and combi models with outputs from 15kW up to 36kW. This range incorporates the latest Riello RDB BLU blue flame burner technology. Available with a 10-year guarantee when installed by a G-One Installer*, the VortexBlue offers the same high efficiencies expected from a Grant appliance while producing lower NOx emissions.